Some people save up and drop everything for adventure. Others work on the road. Knowing your goals before building out a camper will make the journey more comfortable and practical. 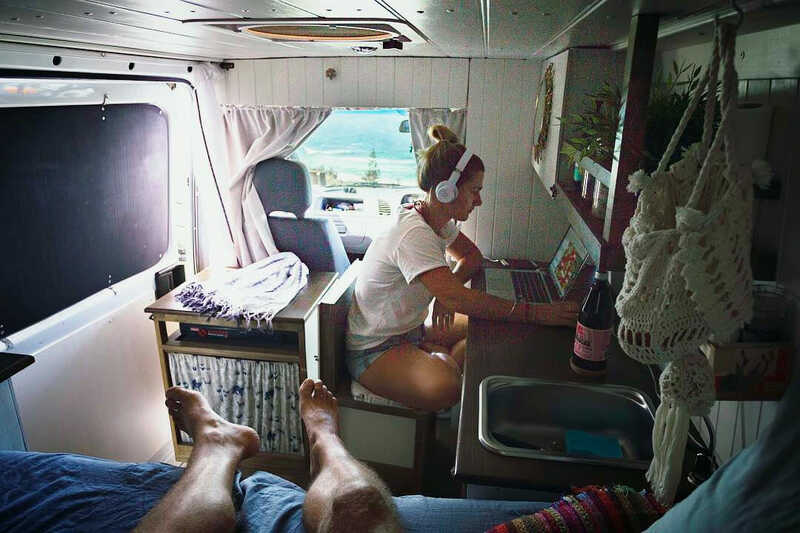 These vanlifers made work a priority and came up with some cool ideas to earn money and travel as digital nomads. Having a desk separated from the bed was important for @adventuringtwo. These two Australians travel in a Mercedes Sprinter van and save space by building storage into their chair. When tucked underneath the desk, the chair looks just like a kitchen cabinet. @whoknowswherenext built a pantry on top of their kitchen counter. The pantry door folds down to create both a cutting board and a workspace. The workspace folds just far enough out over their bed to use as a chair. @wjplata builds and renovates vans. This Ford Transit was built for work and play. It’s got a skylight, desk space and TV. What more could you need? These custom van conversions are based in New York City. Look up WJP Renovations if you want one of your own. 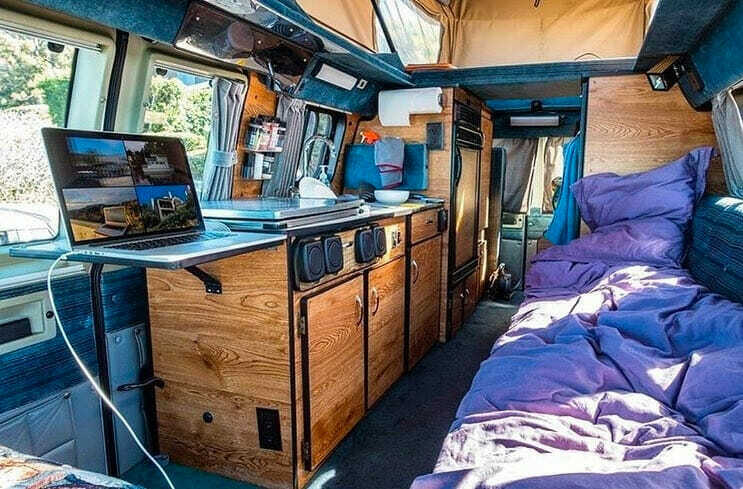 This converted sprinter van belongs to Sydney from @divineontheroad. She is a yoga instructor and full-time traveller. There is tons of space built into the camper with room to stretch your legs and sit straight up. The table folds down into a bed at night. @alpinemargarita travels in a Dodge Promaster. We like the small slide-out drawer that fits perfectly over the bench seating to make a small and useable desk. The AC outlets built right under the shelving also makes for the perfect workspace. This sportsmobile belongs to @ecocamper who works as a programmer throughout the day. The van is built around a mobile workstation that looks pretty spacious for a van. The desk can be propped up for work and folded down when more space is needed. @backpackinglikeaboss helps people set up businesses and monetize their blogs. This mobile office is set up with a table that folds down into a bed and plenty of backyard views. Learn more about this space on Facebook. Have you come across some van office setups with multiple monitors, wireless keyboard and mouse (not in a bus, trailer, etc) that fits into the van experience. I either see these types of just laptops on tables or the extreme van office. Have seen maybe 2 or 3 that were kind of in the middle but nothing more. Trying to get ideas.